This post is the juncture of having just seen my first production of She Stoops to Conquer and having just read The Brain That Changes Itself. First the production. The production I was good, but I walked away thinking it could have gone much further. Comedy is difficult to pull off successfully. Some comedies have additional meaning layer on top of the funny business. This script is purely in search of the laugh. That’s not to say that the characters don’t need to be grounded in truth. They absolutely do. The moment a character becomes aware of or comments on their part within the whole, is the moment that they stop being funny. The characters have to be singularly focused on their pursuit, so that we as the audience can laugh at what they are ignorant of and revel in the moment that it is revealed to them. In a comedy like She Stoops, a whole slew of outrageous events occur and it is the productions job to make it seems as though they were completely accidental – to make the artificial seem like a natural happenstance. The same must be done for each mini-moment of comedy added to the performances. The key is to stuff as many of these moments as you can sustain into the production. And in order to do that, it helps to have some comedians on hand. There is a difference between a comedian and someone who can be funny. A comedian is someone who is wired to continually look for (and play) the joke. For a comedian, finding the funny is a lifestyle. It’s the filter that they view everything through. They talk about being in situations where they knew a joke wouldn’t be well received, but they just couldn’t resist telling it because the humor was there for the taking and they just couldn’t resist. The performers in this production had the ability to be funny but it hadn’t been run through the filter of enough comedians. We talk about people as either being funny or not, a view which is not accurate or particularly helpful. Certainly some people are more skilled at it than others, but it’s a skill just like any other. And the only way you get better at a skill is by practicing it. The Brain That Changes Itself details how the things that we think quite literally shape and change the way that our neurons fire. If we are continually looking for the comedy around you, your brain will become better at finding it. Most of the people we regard as funny don’t lead lives that are significantly funnier than anyone else’s. Instead they are better at noticing the incongruities and absurdities that surround us. They have worked at honing these observations their entire life. So, if we want to create a production that is as funny as it possibly can be, and we’re not thoroughly versed comedians ourselves, we have to do every thing we can to compensate. The most fundamental of which being the way we view the world. In order to up our comedy game, we need to eat, sleep, and breathe comedy. Watch comedy, read comedy, listen to comedy. When you’re waiting in line at the grocery store, think about what the funniest thing (or assortment of things) you could purchase would be. When you’re waiting for the elevator, think about who the funniest person to be on the other side of those doors could be. 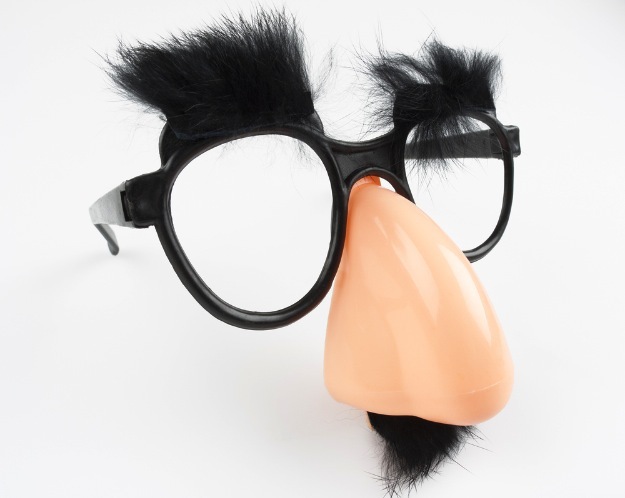 What if you went to your production meetings wearing Groucho glasses? The comedy doesn’t need to be in the style of piece. It just needs to have you continually looking to exercise the funny circuits in your brain (and the brains of everyone involved). A coach who I really enjoy recommends writing the thing that you want to keep at the forefront of you mind on a rubber band and then wearing that rubber band on your wrist until you can train your brain to drift in that direction on its own. Try that. If you’re a post-it fan, try that. The point is to do anything you can to sharpen your eye for comedy. With regard to the rehearsal process, obviously if we can cast actor-comedians, that’s helpful. But short of that, we can recruit the cast to be thinking in the same direction that we are and be on the lookout for moments where jokes can be added – not just when they’re onstage, but at any point. Invite your stage manager, your designers, and anyone sitting in rehearsal to look for missed comedic opportunities. Every suggestion might not make the final cut, but the more you’ve fully explored the options, the better. You know the shenanigans that sometimes make their way into the last leg of a run – things like “work the word ‘banana’ into your dialogue” or “insert the Usain Bolt ‘Lightning Bolt’ gesture into one of your scenes”, or other idiotic challenges? What if those were intentionally added to the rehearsal process so that the stumble through of Act One also involved passing a balloon animal around onstage as inconspicuously as possible? Obviously, everyone has to be on their game in order to do this. You have to make sure that safety comes first. Everyone has to know their lines and blocking. You have to be able to be able to wrangle and structure the fun-times so that work is still being done and it doesn’t just devolve into everybody goofing off. And you have to be able to edit out the bits that aren’t working. But in a piece like She Stoops where the amount of fun that the cast is having only increases the amount of fun audience in having, fostering an environment where everyone can play fully and completely can reap great rewards. And having more options to play only adds more fuel to the fire.